Levy Restaurants is excited to announce the grand opening of Paddlefish, its newest dining experience at Disney Springs, on Feb. 4. The seafood-centric restaurant, formerly known as Fulton's Crab House, has undergone an extensive, multimillion-dollar transformation which involved a full renovation and brand new design that has transformed the vessel into a modern yacht experience. The aesthetic of Paddlefish was inspired by a modern, seafaring yacht with its clean lines, crisp designs, refined woods and a sophisticated color palette of blues and grays. Purposeful elements will be showcased in the dining areas such as a bar that overlooks the newly re-activated paddlewheel. Unique design features include opening up all of the windows for an open-air feel and bar areas decorated with brass accents that resemble fish gills. 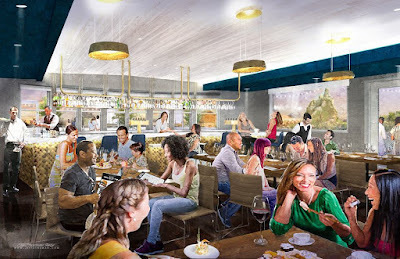 "We're excited to embark upon Paddlefish's next voyage, and can't wait for guests to share this new experience with us," Andy Lansing, President and CEO of Levy Restaurants, said. "As Disney Springs evolves and grows, we're looking forward to sharing this newly reimagined restaurant with both vacationers and Florida locals." Paddlefish's menu will showcase fresh seafood including Maine lobster, King and Snow crabs and a selection of fresh fish including sea bass and salmon. Fan favorites and classic dishes from Fulton's Crab House, such as Lobster Corn Dogs and Crab Legs, will still be offered on the menu alongside new, contemporary options such as Lobster Risotto and Jambalaya. The menu also features interactive dining experiences including tableside services like Lobster Guacamole and Branzino for Two. "It's been incredible to have this opportunity to not only completely redevelop the menu, but also the kitchen design to accommodate it," Executive Chef Mark Boor, said. "I've put my heart and soul into creating a well-balanced menu that will have something that appeals to every palate and I'm excited to finally welcome guests onboard and see that hard work and vision come to life." Paddlefish will be open for lunch and dinner in addition to offering a Sunday brunch. Paddlefish also offers versatile private dining rooms and event spaces to accommodate celebrations or meetings from 20 to 1,000 guests.